Is there any craftsman in history whose name has been more abused than poor old Thomas Chippendale? Born in 1718, he managed to achieve lasting fame as a cabinet maker par excellence. But he was so well-known for his woodworkery genius that it all backfired a bit: in 1943 Walt Disney created two irritating cartoon rodents unforgivably called Chip n Dale. And then in 1979 along came The Chippendales, a male striptease dance troupe so named because the Los Angeles nightclub where they were formed had Chippendale-type furniture in it (and not, as your correspondent had hoped, because they used to apply a quick blast of Mr Sheen to their torsos before a performance). Nostell Priory is one of 26 houses that Thomas Chippendale worked on during his career, not only creating furniture but also in interior design. No prizes for guessing how Nostell got its name; it was a priory, originally established in the 12th century and dedicated to St Oswald. The Dissolution of the Monasteries put paid to all of that and the estate passed through the hands of various owners until the Winn family bought it in 1654. The Winns are still going strong - their ancestor, the 4th Baronet St Oswald, gave Nostell to the National Trust in 1953. 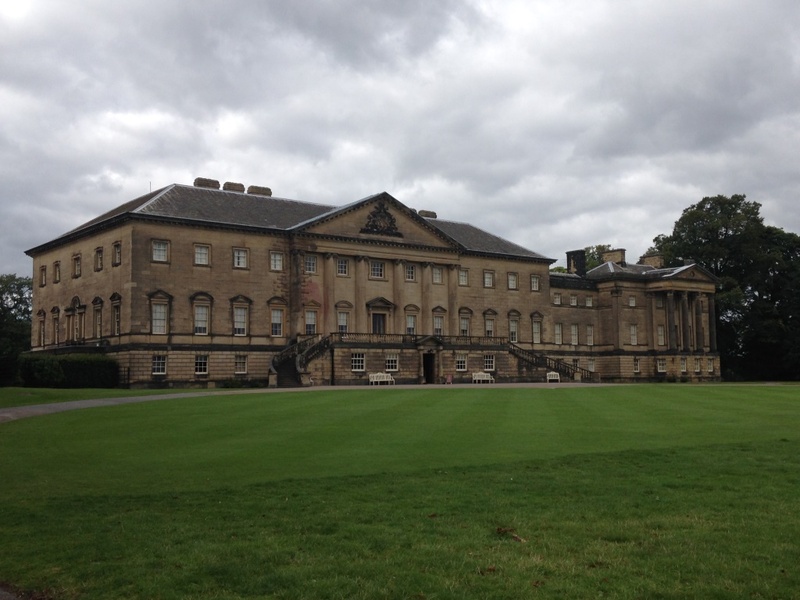 Sir Rowland Winn, the 4th Baronet of Nostell, inherited in 1722 and decided to build a new house. This is by and large the house we see today, although it took a very long time to finish as it is MASSIVE. James Paine started work on the house at the age of 19. It was his first commission and he spent 30 years working for the 4th Baronet. However, when the 5th Baronet inherited in 1765, he decided he wanted a different approach and instructed Robert Adam to continue the house. Robert Adam used the Neo-classical style, rather than Paine's more elaborate rococo approach, and he brought in Chippendale, along with Antonio Zucchi for decorative painting. Here's a quick quiz for you. 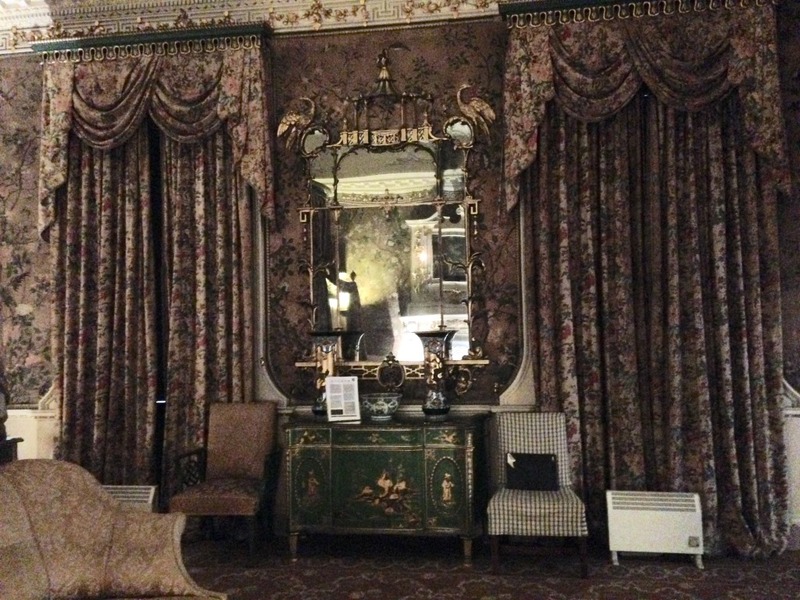 From the picture below, can you pick out what was designed by Thomas Chippendale? If you said 'the big chest of drawers in the middle', then don't feel too embarrassed - I would have said that as well. It's actually the chairs. And the wallpaper. In fact, Chippendale provided bed-hangings, curtains, carpets, trimmings - one of the guides told me that Chippendale was the Lawrence Llewelyn-Bowen of his day. 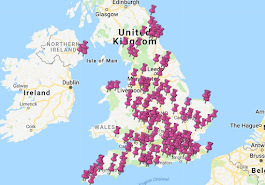 We have established that there is a fairly lengthy queue of folk who have insulted the name of Thomas Chippendale over the years - I think that guide might be at the front of it. Anyway, I also learned that there are approximately 700 proven pieces of Chippendale furniture in the world and about 120 of those pieces are at Nostell Priory. Isn't that amazing? 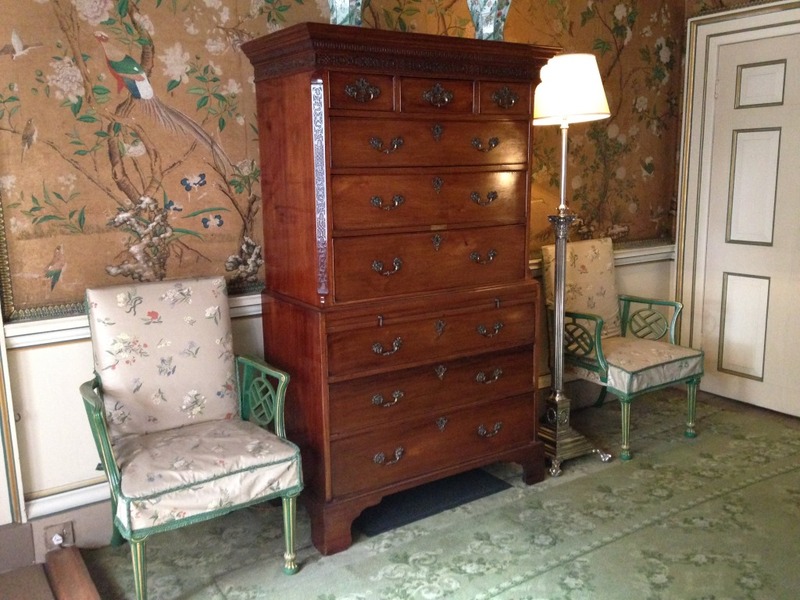 And even then, there are other pieces in the house that look like Chippendale's work but the National Trust doesn't have any receipts or other proof, so they can't claim them. Astonishing. The volunteers at Nostell today were AMAZING. They were the friendliest, most enthusiastic National Trust guides I've come across for a while. One lovely man asked me if I had seen the Brueghel in the Breakfast Room. I admitted that, alas, as it had not leapt off the wall and introduced itself by saying "I'M A BRUEGHEL, ME!" I had failed to notice it. Do you know what he did? He took me back through a shortcut to the room and showed me it so I didn't miss out. Isn't that lovely? And then another guide offered to use my phone to take a photo of me sitting on a Chippendale chair - this was quite legal I hasten to add. Once my scone odyssey is over I will share that photo with you. I can't do it now or I'll be recognised and chased out of every NT property by a catering manager waving a potato peeler. BUT. BUT. Much as I hate to join the queue of entertainment moguls, strippers, and National Trust room guides in offending old Tommy Chippendale, I have to be very honest: I mainly came to Nostell Priory today for the scones. A few weeks ago, Nostell casually mentioned that they were serving a lemon and lavender scone AND a beetroot and mozzarella scone. I was gobsmacked. This is seriously advanced sconeing. You don't start messing about with beetroot scones unless you have Marco Pierre White-levels of confidence. 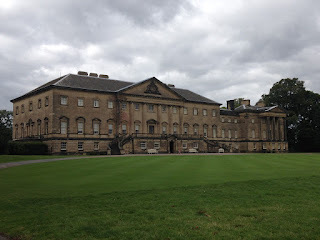 I was full of hope for Nostell Priory. But that was a few weeks ago. 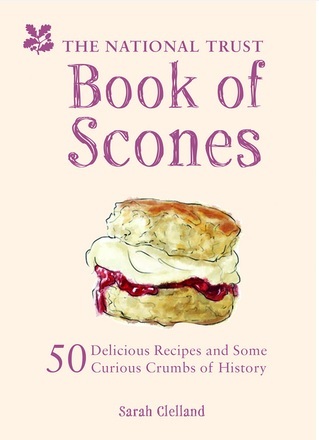 Be careful, I told me, it might have been a one-day-stand of scone innovation, caused by an ambitious work experience kid who had watched Bake-off the night before, or by someone who just had a lot of beetroot. Don't get your hopes up, Scone Blogger. So you can imagine my joy today when I got to the counter and saw THREE - yes, THREE - types of scone! There was a fruit scone! 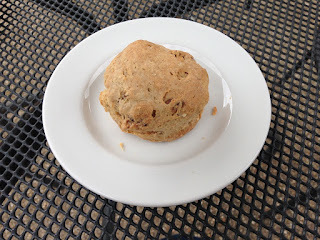 There was a coffee and walnut scone! And there was a peach and vanilla scone! It was like Sconemas Day! I know I should have tried all three scones. I had travelled a long way and this is a monumental study, possibly only second to the Domesday Book. But I just couldn't do it. I couldn't be the woman who ate three scones. 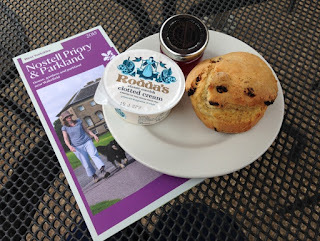 Even if I never saw any of the Nostell tea room staff ever again, I would know that they knew that I had eaten three scones. So I ate two. The fruit scone was a fine scone. It was perfectly crisp on the outside, while light and fluffy inside. The coffee and walnut scone was delicious. It was warm and tasty and I kept eating and eating even when my stomach and head were saying "enough now". Any NT property with three types of sweet scone is a keeper, so head to Nostell Priory at your earliest convenience.